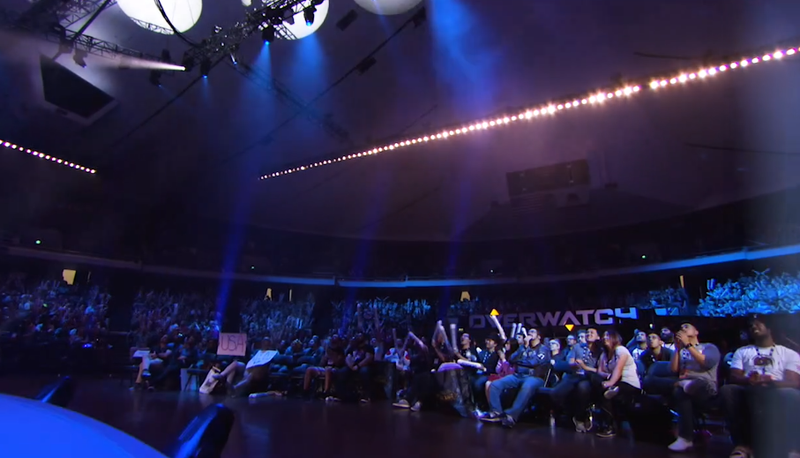 The Ovewatch World Cup at BlizzCon 2017. Following last night’s 2017 Overwatch World Cup, Blizzard shared a bunch of details about how the game’s upcoming professional league will work, including scheduling, prize money, and how the teams will be split up to create separate divisions. The start date is January 10 of next year. Matches will take place four days a week, Wednesday through Saturday, in order to maximize visibility across all of the continents involved. In addition, teams will compete within divisions. The Atlantic Division will include the Boston Uprising, Florida Mayhem, Houston Outlaws, London Spitfire, New York Excelsior, and Philadelphia Fusion while the Pacific Division includes the Dallas Fuel, Los Angeles Gladiators, Los Angeles Valiant, San Francisco Shock, Seoul Dynasty, and Shanghai Dragons. In any given season, each team will play 20 matches within their division and 20 outside of it for a total of 40. The top team within each division at the end of the regular season will automatically qualify for the postseason and get a bye for the championship playoffs. The postseason will also include the other top four teams in the league according to their record, regardless of division. That means that if the Pacific Division happens to have the top five teams in the league overall, for instance, then the postseason would include only one team from the other division. The playoffs for 2018 will run from July 11 to July 22 with the grand final to take place place on July 26–28, the winner of which will get the inaugural championship trophy and a $1,000,000 prize bonus. That will then be followed by an All-Star weekend in August. As for some of the rules and structure regarding week-to-week play, Blizzard states that each game night of the week will feature three matches, each consisting of four-map sets, with the map pool for the season to announced in the coming months. While all of them will be played at the new Blizzard Arena in Los Angeles to begin with, teams will begin traveling to one another’s cities as new venues are created. Finally, the regular season will be broken up into four stages. Each consists of five weeks with a ten day break in-between. The significance of these stages is at the end of one on the final Saturday there will be title matches where the top teams at the time will have a mini-seeded playoff tournament featuring a $125,000 prize pool. This way teams who might already be out of contention for the postseason can still compete in one of the stage tournaments if their most recent five-week record is superior. None of these tournament matches will count towards a team’s overall record. Each of the twelve teams will be at the Los Angeles arena to play exhibitions matches ahead of the start of the regular season on December 6-9.